Durable rubber matting with a wide rib profile. Ideal for commercial and industrial applications, walkways and ramps. Available as 10m rolls, or cut to length in multiples of 1m. Note: If ordering a 3m continuous length, please order Qty 3. If 3 individual 1m lengths are required, please order as Qty 1, 3 separate times. Making surfaces safe for employees to walk on and access regularly is important, as it prevents slips and other accidents from occurring which will reduce employee absenteeism. 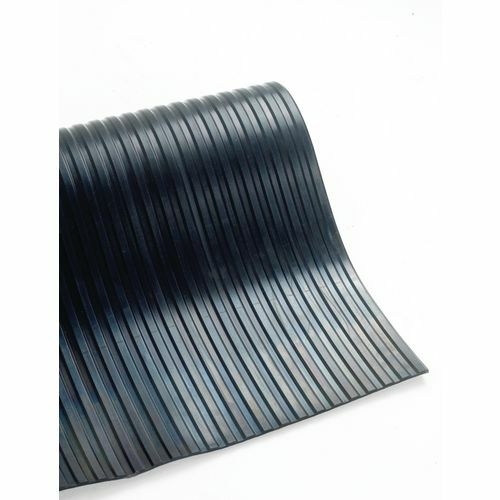 Our broad rib rubber matting is durable and ideal for commercial and industrial applications; this includes walkways and ramps, to make them safer for personnel to walk over them. Another benefit to this matting is that it provides insulation against cold concrete floors, giving more comfort underfoot and helping to retain heat in the areas they are used in. They are available in a choice of two thicknesses; 3 or 5mm, two widths; 900 or 1200mm, and a choice of two lengths; 1 or 10m. This matting is versatile to suit your requirements as they can be loose laid or bonded to the floor to make them permanent. Our broad rib rubber matting is a great solution for insulating concrete floors and making walkways and ramps safer; they are available with a 36 month guarantee.